Linguine and clams….one of my favorite all-time pasta dishes. I’m serious, it is like in the top three! Every time I eat this dish, I am reminded of my all-time favorite travel memory. My sister and I were in Italy for a few weeks exploring and eating/drinking our way through the country. One day, we decided that we needed to visit Cinque Terre for a day trip. Cinque Terre is a coastal area in the northwest of Italy. This area is comprised of 5 beautiful villages and we decided that we would take a little hike with our local vino (duh) and check out the less touristy villages. Well, this little hike somehow turned into a LOONNGGG hike. I’m talking HOT hike, SWEATY hike, HARD hike….get the picture?!? We wanted to go from Manarola to Corniglia and we accidentally took the looong way. Just imagine hiking through steep, rocky terrain and also having to trek up 1200 steps! Well, I must admit the 1200 steps were breath taking beautiful, but come on….they were still 1200 steps! Anyway, this little hike ended up being over 3 HOURS long. We saw farmers looking over their olive groves and grape vines, beautiful little homes with colorful wash being hung out on lines to dry and flower pots overflowing with the most amazing flowers I have ever seen. I think the only thing that saved my life from this treacherous hike was stopping every 10 seconds to take pictures! 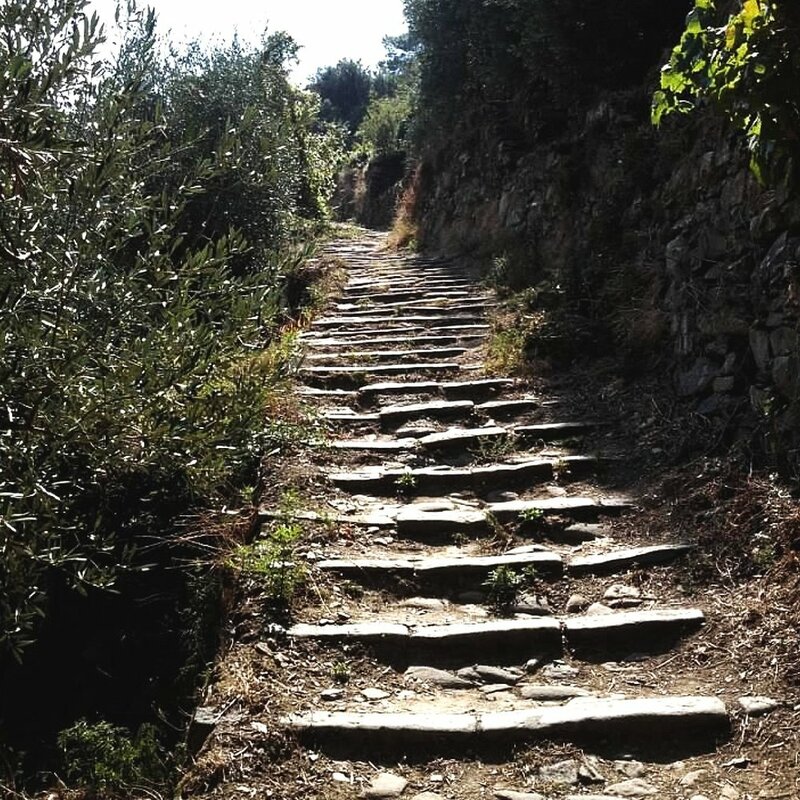 Anywho…..it was the most beautiful hike I’ve ever been on but I can’t tell you the thrill I felt when we finally reached our destination, Corniglia. We were famished, and I was a little sad that I wasted 3 hours exercising and not eating and drinking my way through the other villages that we missed! BUT, there is always next time ….right? So, we found the nearest restaurant and plopped our exhausted butts down and were ready to EAT! Much to our sadness, the owner comes over to us and says that he is closing the restaurant and we needed to come back in a few hours. WHAAAT?? Nooooooo! This Italian man seemed to be a little feisty (read in no mood) and I don’t think that he really cared that we almost died hiking and that we are starving to death! Well, for those of you that know my sister, she was NOT having being told to come back in 3 hours….nope….she was going to eat and eat now! She believes customers are always right, restaurants need to cater to the customers wishes…blah blah blah….the American way of thinking! But, much to my surprise, she actually got this Italian man to serve us! I think he served us because of her efficient ordering…she yelled “linguine alle vongole” (linguine and clam) and two bottles of vino bianco and we will be gone!” I know, I know…2 bottles…don’t judge. To make a long story short…. I know too late, but I've never had a meal taste so good and wine taste so good in my life. We took the train back to our starting point, our villa in Tuscany, and slept like babies. So, as you can see, this dish has a special place in my heart and I love to make it OFTEN. 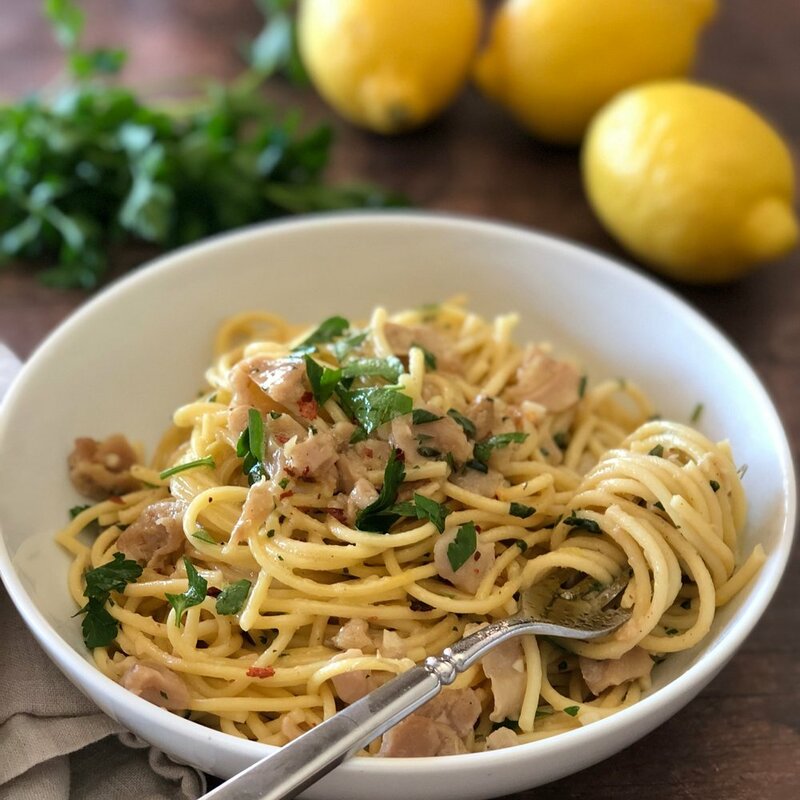 Sometimes fresh clams aren’t convenient or even available, so I created a pantry version of linguine and clams that I think is just as delicious. Now, I’m sure the fussy Italian may not approve, but I’m telling you, it gets RAVE reviews every time I make it. My sometimes “fussy” sister even asked for it twice in one-week last time I visited her. I always keep these ingredients in my pantry so any time after a long day or when friends pop by I can whip this dish up in under 20 minutes. So, give this recipe a try- I know you will not be sorry! Oh, and if you want to add Parmesan Reggiano (Cervasi of course) to it, feel free. We're not in Italy and I won't yell at you! This post was sponsored by Cervasi (yum!) but the recipe, ideas and typos are all mine.